So another challenge for the Card Concept… This time the theme is monochromatic pink. If I am honest I really struggled with this to start out with and I have several efforts that have all finished up in the bin. 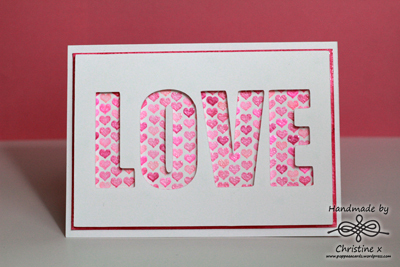 The card I have come up with was also my valentine’s card to my lovely husband – pink screams hearts. 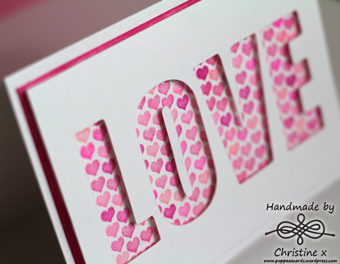 I used my Silhouette to cut the text and layered this over card stamped repeatedly with varying shades of pink hearts. I used pigment inks so that I could emboss the hearts which look like candy in real life. I used my Stampamajig to try to line up my stamping vertically. I think this card would class as Clean and Layered. How bold and pretty!!! Thanks for stopping by my blog, you’re invited to participate on my little giveaway if you wish to. Hi Christine. You have created a gorgeous CAS card. The heart stamping must have been a mission, the embossing makes it very special. I would love to see it IRL. Thank you so much for joining us at The Card Concept. You stamped all of those teeny hearts so beautifully! At first glance, I thought it was patterned paper, but no, you stamped each and every little one! Beautiful! this is just gorgeous – I absolutely love it.